Cemetery of the RHSJ, Bathurst, N.B. 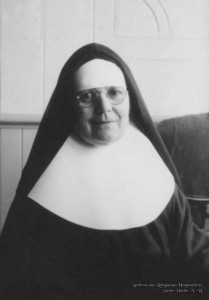 The theme song Salut à toi was composed around 1948 by Sister Rhéa Larose, then a teacher and principal of Hôtel-Dieu Academy. The melody was borrowed from O, ma Laura, theme song of a popular movie. Young pupils and students of the Academy and College Maillet knew the song well and used to sing it on official circumstances as well as at informal gatherings. The motto of the school and college was: Be faithful. Sister Larose, great friend of the youth and founder of Maillet College, was a very determined person, a cultivated woman, completely dedicated to God. Her contribution to higher education was officially recognized on September 24, 1999, when the Saint-Louis-Maillet Campus in Edmundston, constituent of Université de Moncton, named its library Bibliothèque Rhéa-Larose. On the occasion, Sister Jeannine Michaud, former head of the library, and Sister Bertille Beaulieu, professor of French studies, represented the congregation of the Religious Hospitallers of Saint Joseph. Ms. Marie Elisa Ferran, who had been hired by Sister Larose to teach at Maillet College in 1964, made the following presentation. « Born on November 11, 1899, in Ottawa, Rhéa first studied at the Grey Nuns’ convent in Ottawa and was seventeen years old when she started to work at the federal department of Defence and Statistics in Ottawa. 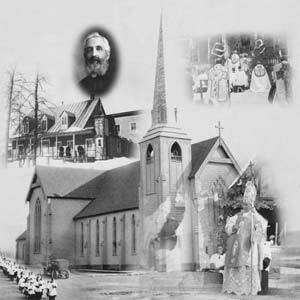 Being attracted to religious life and Madawaska region, she entered the noviciate of the Religious Hospitallers of Saint Joseph in Saint-Basile, in 1926. Her association with Sister Maillet and further studies in arts and social sciences soon transformed the young Sister Larose into a true pioneer. 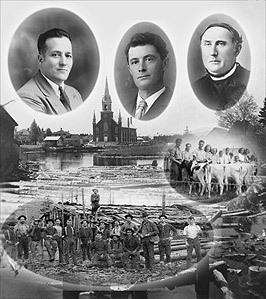 Woman of her time, ardent francophone, the young teacher had a dream of creating a vital, intellectual and spiritual space for young women from Madawaska, by offering them the opportunity to carry on their studies towards the Bachelor of Arts degree, as did the young men attending St. Louis College in Edmundston. With the courage and tenacity that characterized her, Sister Larose founded Maillet College in 1949, with the help of her religious community and the collaboration of the Eudists Fathers. She was a firm believer that young women, as well as young men, deserved equal opportunities in higher education. With great energy, she worked at the implementation of programs for the B.A. degree, programmes in sciences, medical and legal secretaries, a B. A. in Nursing, and a Teachers’ College for the sisters. She also organised cultural and artistic activities and was head of Maillet College from the beginning until 1965. Her great determination was the nerve of many educational projects in Madawaska. The honour bestowed upon her by giving to the library the name Bibliothèque Rhéa-Larose was well deserved and rests upon her contribution to the development of fine arts and letters, her vision of a world where women would participate in social progress, not to forget the love of books and beauty that she shared with all, whether it be in music, dance, literature, visual and dramatic arts.